In this elegant drawing, Paul César Helleu has rapidly drawn this stylishly attired woman using his signature loose gestural draughtmanship. This looseness and ease of depiction suggests that the work was finished in situ, rather than through a series of studies, which is how Helleu preferred to work. Although this drawing was clearly composed rapidly, Helleu has taken careful care in depicting the sitter’s fashionable dress- her fur hat with jaunty feather; her fur cuffs; fashionable collared skirt suit; and dainty shoes. Additionally, he has delicately rendered her up to date makeup and hairstyle by judicious application of colour. 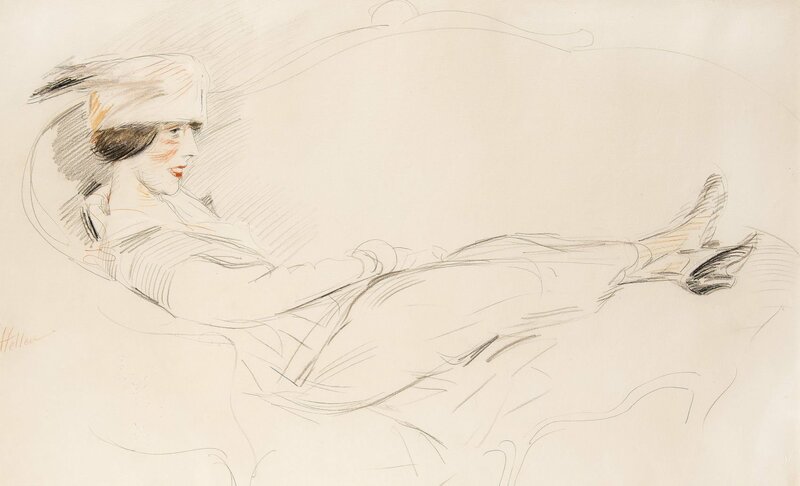 Paul César Helleu has created an exquisite drawing of a society lady at rest on her ornate settee; his trademark. Paul César Helleu worked as a painter and an engraver in France at the turn of the Century. His work epitomises the charm and elegance of French culture at the time – the belle Époque. He gained renown for his portraits of society ladies on commission, but a true graceful sensitivity arises out of his portraits of his wife, Alice. He met Alice Guerin when she was only fourteen, and obeyed her parents’ wishes to wait for her to turn 16 to get married and live at home two years after that. Though he moved to Paris when he was a young man, Helleu was born in Vannes in 1859. His first job was painting on ceramics. He later became a pupil of Jean Leon Gérome at the École Nationale des Beaux-Arts and befriended fellow student John Singer Sargent. Gérome was to buy his first painting. The Second Impressionist Exhibition of 1876 profoundly impacted Helleu and Sargent. It went so far that Helleu applied to the group and was accepted as one of them. However in 1886 when he was invited to the eighth exhibition, he was advised not to exhibit by his friend, Impressionist Claude Monet. Helleu earned a living that enabled him to enjoy yachts and sailing – a pleasure he inherited from his father, a naval officer. He mixed with English and French society at Deauville and Cowes which served to increase his popularity. His wife enjoyed entertaining on their boat L’Etoile and Helleu painted many canvasses of life on board and other harbour scenes.